Ladymeads milking goats who have benefited from Camrosa for mites and minnor wounds. Does your goat have dry, scurfy, itchy skin, sores and hair loss? It is an effective water repellent barrier against flies, midge bites, wet, mud, mites and against some of the effects of pollution, all of which can affect goat skin. 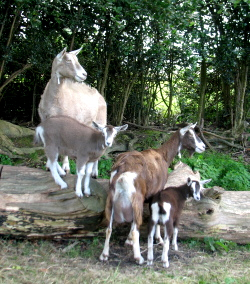 Problems, such as mites, can lead to dry, itchy skin on goats, resulting in scratching and hair loss. The ointment promotes the natural healing process of cracks, sores, callused skin, fixed scabs, superficial wounds and soothes dry, irritated, itchy skin on goats, keeping the skin supple. Good skin condition is necessary for healthy hair regrowth where there has been hair loss in goats. Camrosa Ointment is economical to use and long lasting in all weathers. It does not melt in heat or wash off in rain so your goat can be put out in the field as usual. Does your goat have lice?